The Hawaii State Energy Office EV Stations Hawaii mobile application (and web-based application) is designed to help drivers locate publicly available electric vehicle (EV) charging stations statewide. The free EV Stations Hawaii app is available for Apple and Android smartphones and mobile devices. The app helps EV drivers locate the nearest charging station, giving them the confidence that they can recharge while they’re on the road. 1. Why are EVs important to Hawaii? EVs are an essential part of Hawaii’s transition to a clean energy economy. Each EV on the road represents a reduction of the consumption of imported petroleum fuels and a step forward in moving our islands closer towards energy independence. 2. What is the purpose of the “EV Stations Hawaii” app? The purpose of the “EV Stations Hawaii” app is to help EV drivers locate publicly available charging stations statewide and to reduce their concerns about “running out of juice” before getting to their destination or to the nearest charging station. 3. Why did the State create this app? The State Energy Office recognized the need for a Hawaii-specific, locally owned and managed EV charging stations app with accurate information that drivers could rely on. The EV Stations Hawaii application was developed to reduce driver’s concern about running out of “juice” before getting to their destination or to the nearest charging station. As the State of Hawaii moves toward transforming government into the 21st century, the EV charging station app is the perfect example of new and innovative technology serving Hawaii’s community! 4. What does the EV app do? 5. Who should use it? The “EV Stations Hawaii” app is best suited for drivers of EVs. 6. Why should I use it? You should use the application to have the most up-to-date information on the location and access to publicly available charging stations in the State. 7. How do I get the app and how much does it cost? The “EV Stations Hawaii” app is available for download free of charge online on Apple and Android smartphones and mobile devices via their respective app stores. 8. Once I download it, how does it work? One can use the app to search for EV stations across Hawaii or for EV stations closest to their current location. Note: The Locate Nearby EV Stations function will only work if the location service on the browser is enabled. 9. Which islands will it work on? It will identify publicly available EV charging stations wherever they are available throughout Hawaii. 10. Who is managing the database of charging stations? The Hawaii State Energy office is managing the database of charging stations. 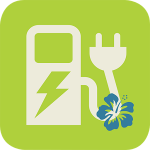 The “EV Stations Hawaii” app utilizes the Hawaii State Energy Office’s database of publicly available EV charging stations, which is also available online at electricvehicle.hawaii.gov. The app is a partnership between the state’s Department of Business, Economic Development and Tourism, Hawaii Information Consortium and Honolulu Clean Cities, and is part of the State Office of Information Management and Technology’s open data movement. 11. If I know of an EV charging station that is not listed, how can that information be added? Property owners or managers with an EV charging station can complete the form found on electricvehicle.hawaii.gov. App users can also share new public EV Charging Station information via the Feedback feature on the app. The feedback will be sent to the Hawaii State Energy Office, which will then update the charging stations database used by the app. 12. I noticed the app was not working properly. How do I report a “bug”? Users can offer feedback via the feedback feature on the app. This feedback will be sent to the Hawaii State Energy Office, which will then pursue the bug fix. 13. How do I report an inoperable public charging station? The Hawaii State Energy Office is not responsible for the care and maintenance of charging stations listed in this directory or located in the State of Hawaii. If you would like to report any service issues regarding a charging station, please contact the manufacturer or station owner. Users can report an informational issue with an existing station in the system using the feedback feature on the app. This feedback will be sent to the Hawaii State Energy Office, which will then update the charging stations database used by the app. 14. How do I leave a message for the webhost? Users can leave a message for the webhost via the feedback feature on the app. 15. What is the ideal app usage environment? Ideal usage is a mobile device which utilizes GPS location services without a wifi or hotspot internet connection. 16. Why not use wifi or hotspots? The internet connection will have a unique IP address for all connections which can potentially place your current location in an incorrect location. 17. What is the difference between a Charger and a Port? A “Charger” or Charging Station can have one or more ports. The number of “Ports” determines how many vehicles each charger can service at a time. One “Port” can service one vehicle. 18. All stations say “parking fees may apply”. How come the app doesn’t specify parking fees? Disseminating parking fee information is beyond the scope of the EV Stations Hawaii app. Please contact parking facilities directly for applicable parking fees. 19. Will the app be updated to let EV drivers know if a station is in use? 20. What is the purpose of the list and sort options? The list option will display the EV stations in a sortable list view. The sort option will allow you to sort the list of stations by predetermined criteria. 21. Can we report ICE’ing in the feedback form? DBEDT recognizes that getting ICE’d, or being blocked from access to charging stations by vehicles with Internal Combustion Engines (ICE), is a concern to EV drivers. App users can offer comments via the feedback form. However, DBEDT is not responsible for reporting ICE’ing to enforcement agencies.